Strong atop the pyramid of dance music, Dutch maestro Armin van Buuren held down one of the most tremendous weeks across the Amsterdam Dance Event this year, including a whirlwind of A State Of Trance festivities. Showcasing one of his wildest ideas yet, Armin and his A State Of Trance (ASOT) team pulled together one of ADE’s most heavenly performances, quite literally. About a dozen media professionals were escorted to a surprise location just outside of Amsterdam City Centre, with only one clue as to where the afternoon would take them. “It would be a journey of great heights…” was the hint that all were left to ponder, and the scene everyone stumbled upon was one out of your wildest imagination. Hovering 200+ feet in the sky, one lone crane lifted Armin and guests up in the air for the ride of a lifetime. With booming sounds of trance soaring through the atmosphere, smoke machines mystifying the platform, and an aura of pure energy surrounding all those up high, the experience was one of astonishing awe and excitement. Revealing the ASOT 900 theme of the year, “Lifting You Higher,” the audience both there and via live stream echoed the mantra of the entire stunt quite perfectly. Alongside the new theme song, Armin threw down his anthem track “I Live For That Energy,” whilst announcing major headlines for 2019. With the first act of Utrecht being none other than legendary DJ/Production duo Above & Beyond, both Madrid and Kyiv will follow as cities of the ASOT 900 world tour. New music, a new theme, and new tour stops are simply the sweet cherry on top off this already radiant celebration and outstanding milestone. 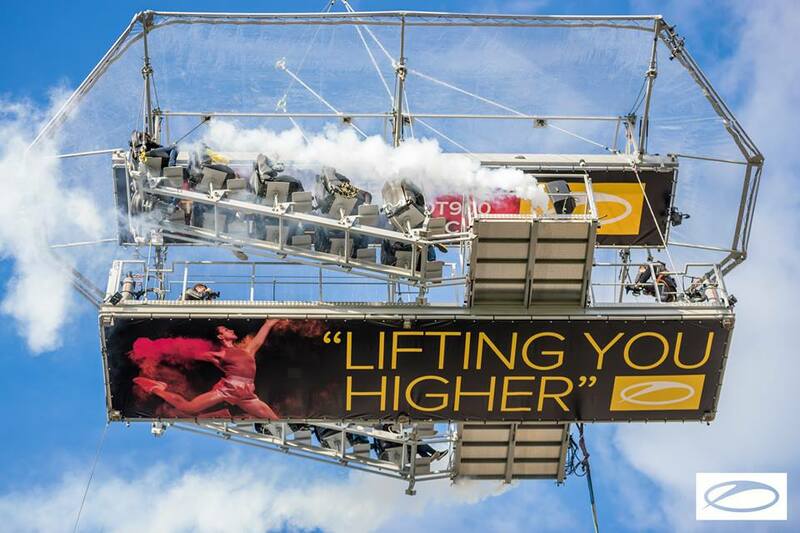 Upping the ante of ASOT’s theme reveal each and every year, Armin and his dream team took “Lifting You Higher” to the absolute next level. Going above and beyond to ensure the perfection of this once-in-a-lifetime reveal, guests were simply stunned to be experiencing the music and melodies of the King Of Trance himself, alongside crew members who broadcasted the set live on the ASOT radio show. An event like this is yet another example of why Armin remains one of the most inspiring and iconic artists the electronic industry has seen to date. His legacy will go on forever as moments such as this extend far beyond the realm of what is possible, breaking norms and pushing boundaries to the max.